It's getting colder here at Bryant Park but the preparations for Winter Carnival are heating up. 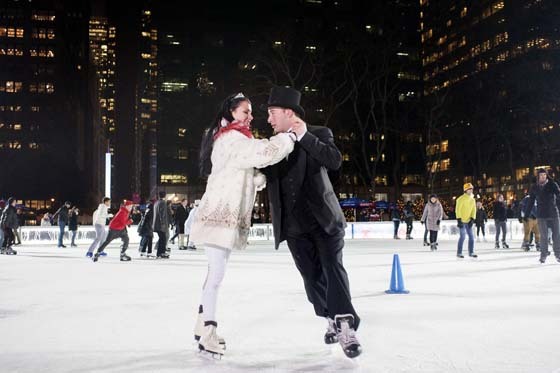 This will be the second year for this event at Bank of America Winter Village. We're excited to see the return of some of our favorite activities from last year as well as the addition of exciting new experiences. Mark your calendars for February 5th and 6th and join us in the park for some respite from the winter blues. Take a look below for more information on some of the signature events to gear up for this February. Gather around The Rink on Friday, February 5th, from 6:30-7pm for the debut of the Winter Carnival Skating Showcase featuring the Skyliners Synchronized Skating Team as well as Adam Rippon, and pair skaters John Coughlin & Caydee Denney. The Skyliners perform at the GMA 'Frozen' Sing-a-long in 2015. Photo by Donna Young. 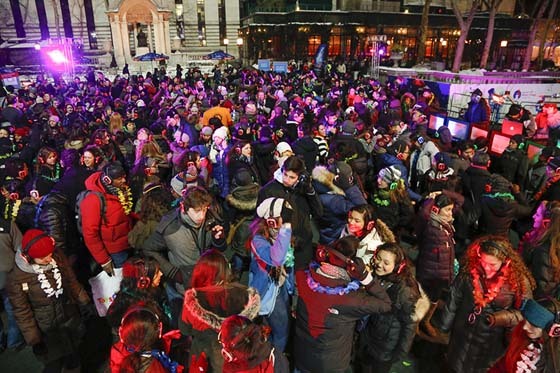 Every year for the past few years The Simulacrum of Yore Society, organizers of guerrilla events around the city, have hosted a flash mob "Ice Ball" on The Rink, inviting revelers to dress to the nines and enjoy a night of skating whilst enjoying winter classics. After receiving tons of press last year in the New York Times Style Section and the Wall Street Journal, The Ball has grown so much that we've decided to make it an official Winter Carnival event. Join in on the fun on Friday, February 5th, from 7-9pm on The Rink. As always, admission is free, and skate rentals remain the same price. The Society requests a dress code of "Impressionist Formal." For more information on what that entails, read their blog post here. Photo by Andrew Lamberson. Returning for the second year is Silent Disco, a free outdoor dance party with a twist. All guests receive a pair of wireless headphones and tune into the same hits being pumped out by our three guest DJs. Toggle between each of the three sets on the headphones, which light up to show which channel you're listening to! Those looking in from the street won't hear a word and will be amazed by the group of chilly revelers somehow dancing in sync. Join us on Saturday, February 6th, from 7-10pm on the Fountain Terrace. Only those with headphones can hear the music. Be on the look out for announcements about the other great events arriving at this year's Winter Carnival.